Flexibility describes the amount of movement that can be accomplished at a joint, such as the knee or shoulder; this is also referred to as the range of motion about a joint. It is an often overlooked component of fitness, which is unfortunate, because maintaining it may help reduce the risk of injury and can also help improve performance in many activities. Increased physical efficiency and performance. A supple joint requires less energy to move through the range of motion. Decreased risk of injury. Most experts agree that a more supple joint is less likely to exceed tissue extensibility during activity. Increased blood supply and nutrients to joint structures. It may also contribute to improved circulation and nutrient transport, allowing greater elasticity in tissues. Improved nutrient exchange. Range of motion exercises may increase the quantity and decrease the viscosity, or thickness, of synovial fluid, thereby enabling better nutrient exchange. Healthy synovial fluid also allows greater freedom of movement and may decelerate joint degenerative processes. Improved muscular balance and postural awareness. Decreased risk of low-back pain. Reduced muscular tension. Stretching promotes muscular relaxation. Enhanced enjoyment. You are much more likely to stick with a program that you enjoy. By relaxing both the mind and body, flexibility training increases your sense of well-being and personal gratification during exercise. Not to mention, it just plain feels good. Never stretch past the point of comfort. Always do static (long, held) stretches (preferably 15-30 seconds). Ballistic stretching (bouncy, jerky) movements are more risky and should only be done for sports specific training and not usually by general population. Although there is continuing controversy over the benefits of stretching, which stretching exercises are best, whether to stretch before or after exercise, or just how much to stretch, I believe that if you adhere to the above rules you will reap the benefits of improved flexibility and enhanced well-being. At the very least, you can stretch between sets when strength training. You have to rest for 30 to 60 seconds anyway. Why not spend that time stretching the muscle you just worked? I find that it also helps you keep your focus on what you are doing and which muscle group you are working while strength training. And oh yeah, did I mention how good it feels? Well, it does! So come on and join me in a stretch. Go here for illustrations of the basic stretches for every major muscle group. See, there really are no more excuses. Let's stretch like there's no tomorrow, baby! 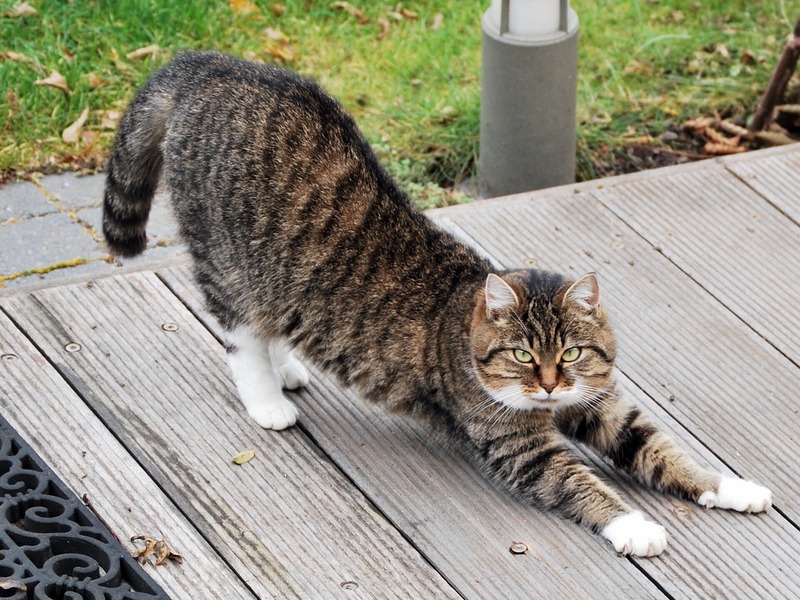 How many dogs and cats do you hear complaining of stiff muscles or pulled hamstrings? Not too many. Know why? Watch them next time they get up from a nap or a lying position. First thing they do is streeeetch with long, held stretching, and they take their time moving after a nap too. We could learn a thing or two from our four-legged friends.